Ideal set for scrapbooks, paper crafts, cards and other crafts that need precise, controlled treatments as well as large applications. Set includes 2.75g Glue Stick Pen, 6g Photo Stik, 25g Extra Strength Glue Stick, and 1 oz. Memory Glue Pen. LePage 100% Glue Repair Gel uses our revolutionary FLEXTEC. formulation that bonds multi-materials when projects or repairs require higher viscosity, tremendous bond strength, and resistance to extreme conditions. It is a versatile, gap-filling adhesive that bonds, seals and repairs almost all materials. It is ideal for bonds subject to harsh or extreme conditions or for situations where constant flexing is a problem. It can be used indoors and outdoors, has excellent adhesion and high initial grab that cures quickly. 100% Glue Repair Gel dries clear and creates a flexible and durable bond which is dishwasher safe and has excellent resistance to vibration, impact, moisture, UV and extreme temperatures, offering long reliability anywhere it is used. LePage Super Glue Multi-Purpose Liquid has proven superior performance over ordinary super glues. It works faster and holds stronger on more surfaces than ordinary instant adhesives thanks to a patented additive. The liquid formula works well on a variety of porous and non-porous surfaces. It dries clear and sets without clamping. Super Glue Multi-Purpose Liquid is resistant to moisture, most chemicals and freezing temperatures. The convenient single-use tubes are great for quick repairs and small projects. LePage. Pro Carpenters Glue is a ready-to-use, multi-purpose, high tack, polyvinyl acetate woodworking adhesive (aliphatic resin glue). It is specially formulated for carpentry and cabinet making. Pro Carpenters Glue has a greater wet tack than white glues, which allows faster gripping action and less slippage during the clamping process. It dries to a tough, high strength, humidity resistant bond. Pro Carpenters Glue dries to a translucent light yellow to blend with many wood grains, especially pine and is sandable and paintable Pro Carpenters Glue is non-toxic as per U.S. Federal Consumer Product Safety Commission, ASTM D 4236 and contains no urea formaldehyde. It also conforms to CSA 0112.4, CGSB 71-GP-5 and ASTM D4317-88 (10.2). 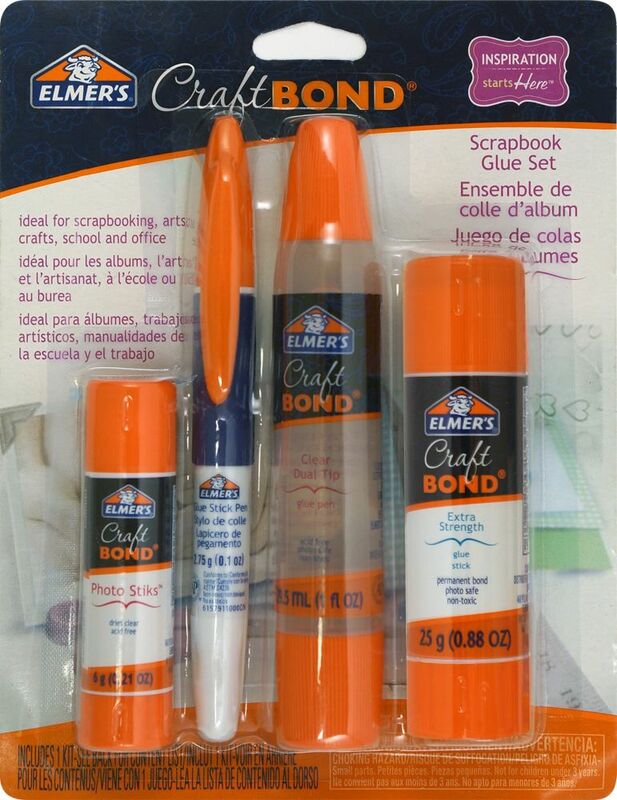 Scrapbook Glue Set, 4pk Ideal set for scrapbooks, paper crafts, cards and other crafts that need precise, controlled treatments as well as large applications. Set includes 2.75g Glue Stick Pen, 6g Photo Stik, 25g Extra Strength Glue Stick, and 1 oz. Memory Glue Pen.